ReportGarden helps you generate reports automatically at the beginning of every month. To get started, you will need a template of the report that you want generated automatically. The system provides with a few sample templates and that you can use. 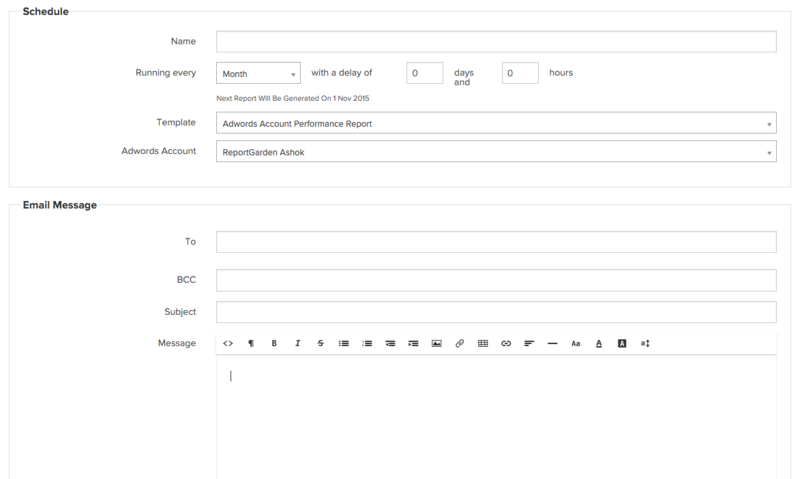 The form below will help you setup your scheduled reports. You can find this form by clicking on "Scheduled Reports" in the left side bar and then clicking on "Schedule New Report" button in the top right corner. 2. Running every: In order to generate your report every month, please set the 'running every' value to "Month". 3. Delay: The delay fields help you manage when the report is generated. For example, if you want your report to be generated on the 2nd day of the month at 10am. Please set the delay to 1 day and 10 hours. 5. Account: Depending on the template you choose the form will request you to select the account(s)(adwords/analytics etc) it needs to generate the report. After you fill the above details, please press the "Submit" button below the form. This will schedule your monthly report.